Today when I published my previous post and searched it on Google I really surprised because of Google's faster crawling speed on my blog. 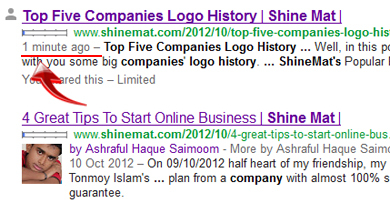 It took just one minute (might be few seconds) to index my post in their database to appear in SERP (Search Engine Result Page) Alhamdulillah! I was really very happy when I saw how fast Google crawl this blog. I took a screen shot instantly to share with you all. Update: WooHoo! Finally I just saw it took just few seconds to index my posts. Thanks to God. If I got any attractive updates about that I will surely share with you. How to get faster crawling speed by search engine bots? ■ The prime way to get faster crawling speed you have to be publish UNIQUE and QUALITY posts frequently as I say always. ■ Increase backlinks, because when search engine spiders get your blog links in various blogs and sites it will know that your blog is really valuable. This will increase your blog’s pagerank. If you don’t know how to increase backlinks please read this post. ■ Do SEO techniques. SEO will make your blog more friendly with search engine robots. So, why don’t you be a good friend with search engines? ■ Decrease your blog load time. Because Google serious about this. Avoid big images, flash videos, lots of advertisements and huge plugins and remove broken links from your blog. Remember, Simple is best. Don’t you think so? See Google’s home page. Oh! you can use Google's PageSpeed tools to check and compare your blog load time. If you get your score less than 80 then you have to remove extra scripts, images, videos etc. Also it is necessary to check that your server is working 100%. Good day with peace and blessings, Be happy! I am doing every thing to get crawl my blog post . But it is taking about 2 week to crawl my site . I also want to appear my post to google within minutes . nice post dear.. you are great ..